There’s no better place to up your Instagram game than New York City. Around every corner is a chance to make your followers green with envy. 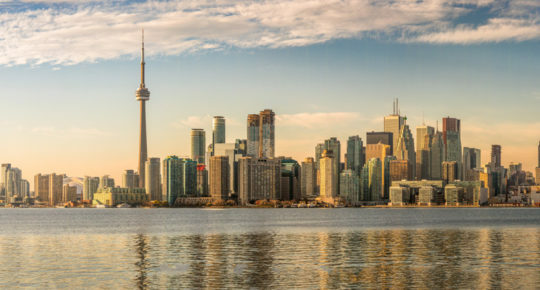 To make life easier, here are my seven favourite spots to get that insta-worthy shot. The Brooklyn Bridge is one of the most iconic sights in New York and offers some of the best photo opportunities. There’s a dedicated spacious bike lane and walkway on the bridge that sits above the six lanes of traffic. From Manhattan, the entrance begins just across from the northeast corner of City Hall Park along Centre Street. Once you’ve arrived in Brooklyn there’s an exit for Dumbo. Dumbo, the neighbourhood whose name is an acronym for Down Under the Manhattan Bridge Overpass is one of the most-visited spots in Brooklyn and it’s easy to see why. It’s a hotbed of dining, recreation and shopping with great views of the Lower Manhattan skyline. 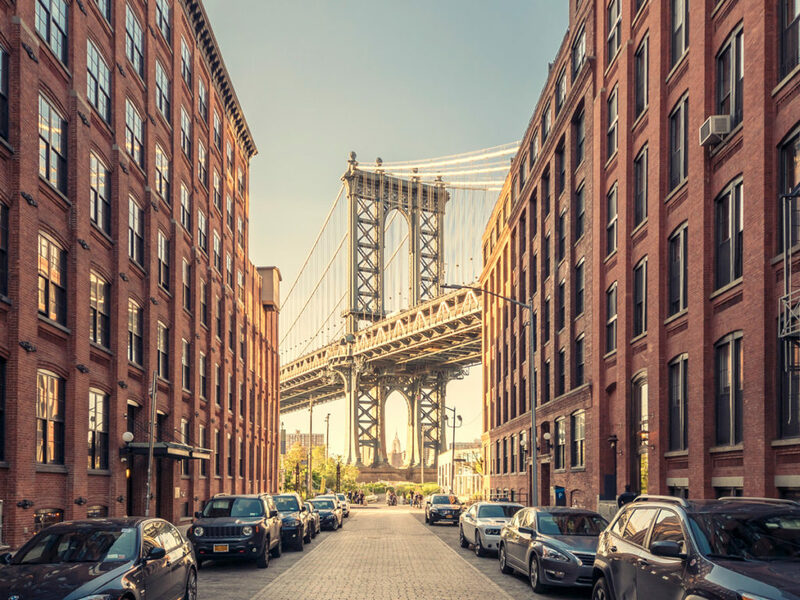 Go to Washington Street between Front and Water Streets to capture a shot that features Dumbo’s cobblestone streets, the Manhattan Bridge, and the Empire State Building. To conserve your energy for more exploring you can take a subway back to Manhattan. Insider tip: Obviously popular by demand, this location gets flocked with tourists so arrive early for less of a crowd and perfect lighting. 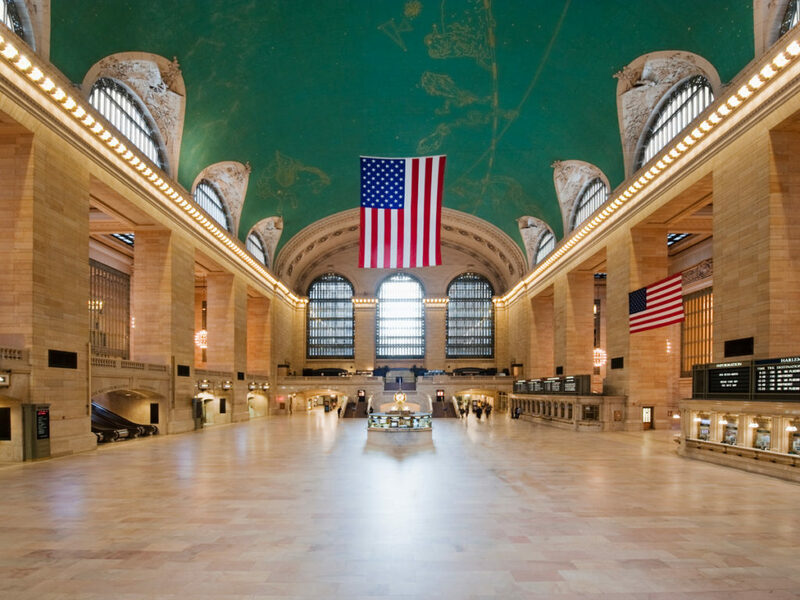 Located on 42nd St and Park Ave, Grand Central is one of the busiest train stations in the world, and serves nearly 200,000 commuters every day. Undoubtedly, the most classic and beautiful transportation hub of New York, Grand Central offers a stunning location for photos. For the perfect shot, go to the ledge overlooking the main floor. Don’t forget to look up – the ornate vaulted ceiling is decorated with a mural of the constellations. Insider tip: If you’re trying to get a less crowded photo, try going at between 10pm-11pm. There are usually no trains coming in from Long Island so it’s not as busy. What’s a trip to NYC without a Central Park photo! 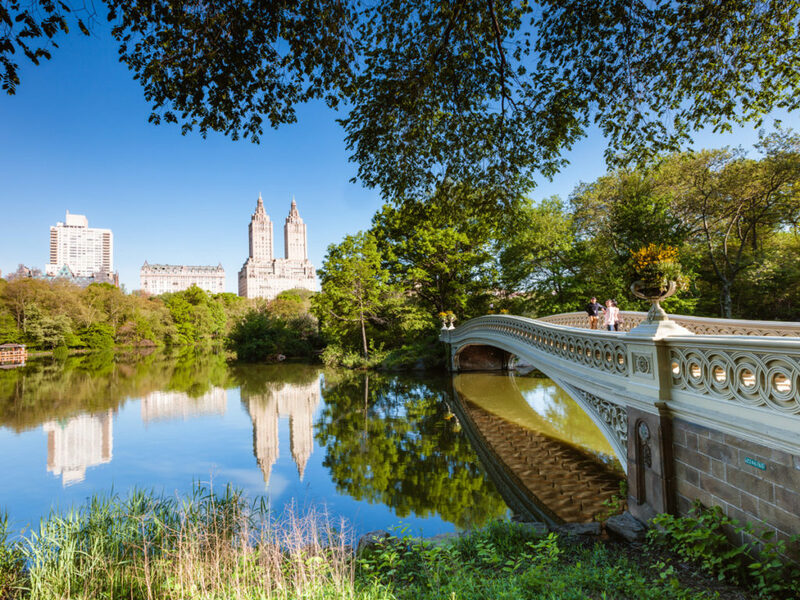 Arguably, one of the most famous parks in the world, Central Park is a manmade wonder. Not only is it the first public park built in America, but it’s also one of the most frequently visited, with over 25 million visitors per year. But don’t worry. There’s plenty of space for everyone. The best way to navigate Central Park is to bookmark the places you want to see ahead of time and make a route, that way you won’t miss any of the sights. Insider tip: If you’re feeling energetic you could rent a bike and ride through the park taking breaks for photos. The Statue of Liberty, one of New York’s most popular tourist attractions, has captivated travellers from every corner of the world for over 100 years. 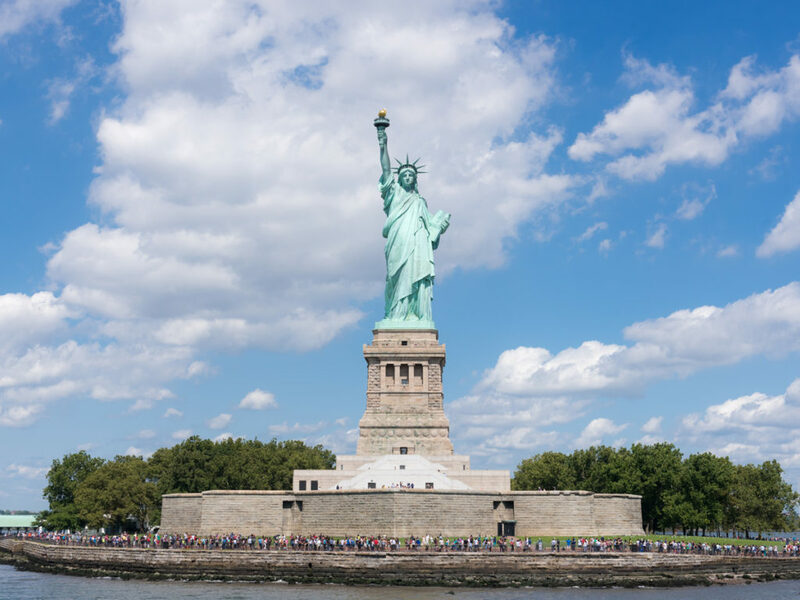 It’s one of the most iconic sights to see in the city, and one of the best photo opportunities in the world – a visit to Lady Liberty is highly recommended! If you’re short on time you can get some of the best views from the Staten Island Ferry, the free ferry runs 24 hours a day and departs from Whitehall Ferry Terminal (also known as South Ferry) in Manhattan. Insider tip: Get to the ferry terminal early and try and get a spot on the right-hand-side deck of the ferry for the best views. 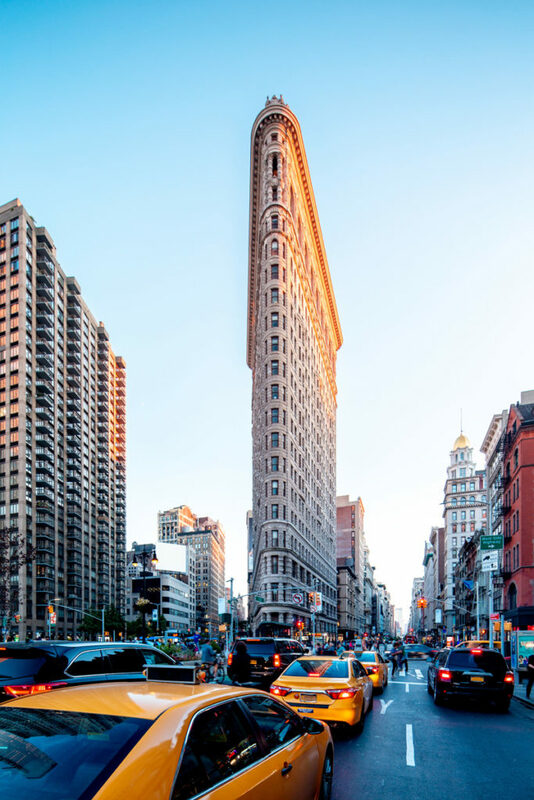 Head to 23rd Street and you’ll be struck with the awe-inspiring Flatiron Building. The Flatiron Building is one of the most famous historic landmarks in New York. The iconic twenty-one story building, best known for its triangular shape, was one of the early spectacular high-rises that have come to define Manhattan. For the classic shot head to 23rd and Broadway. Insider tip: Head there early morning or dusk to avoid the harsh lighting of noon. Otherwise, an overcast day is your best bet. Designer boutiques, fancy chain stores and high-end art galleries make trendy SoHo a top shopping destination. It’s also a great location for photos featuring the quirky cobblestone streets and lofty buildings. If street art is more your thing – SoHo has you covered. Take a walk down Broome Street and you’ll see some of New York’s most famous street art, including Tristan Eaton’s iconic Audrey Hepburn mural. 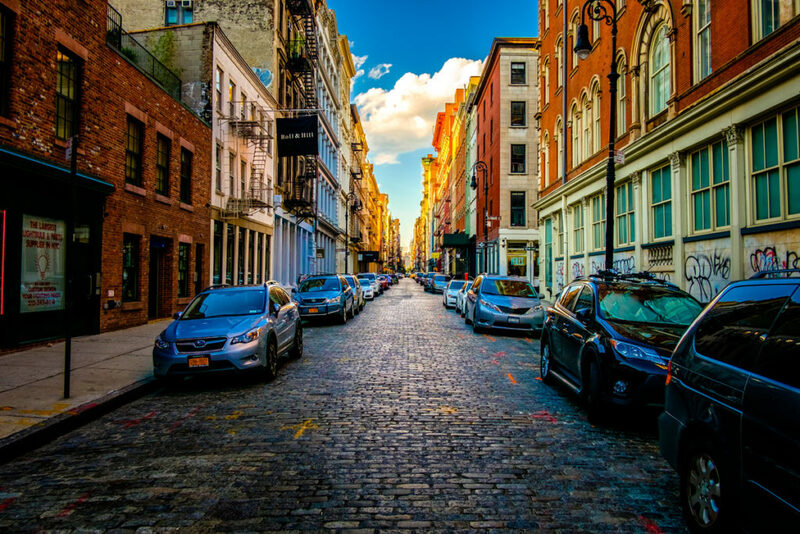 • Greene Street has stunning lofts, cobblestones, and shops. • Head to Kenmare and Lafayette for your classic La Esquina shot – a cool, no frills Mexican set in an old school American diner. • West Broadway is less crowded than Broadway and has a boutique feel. • Try the Nomo Hotel on Crosby Street for the stunning entrance. Insider tip: SoHo is home to some of New York’s best cafés and bakeries – head to Georgetown Cupcake for a treat. 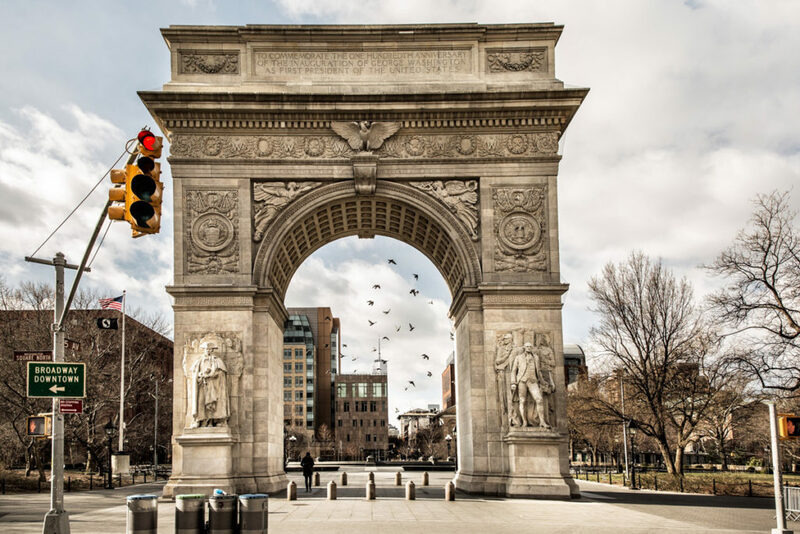 Add a little Parisian inspiration to your photos with the Arch in Washington Square Park. Modelled after the Arc de Triomphe in Paris, this smaller New York replica is a stunning feature just off of 5th Avenue and Waverly Place. Once in the park, you can enjoy the scenery and people watching. We offer up to three flights a day to New York City from Dublin. Twice daily flights from New York’s JFK and a daily flight to Newark. Both airports have great transport links to the Big Apple. Book your trip to New York City now at aerlingus.com. Read next: The ultimate New York shopping guide.